Kohn goes on the explain intersubjectivity in a meeting (conversation, circumstance, Dasein etc) . 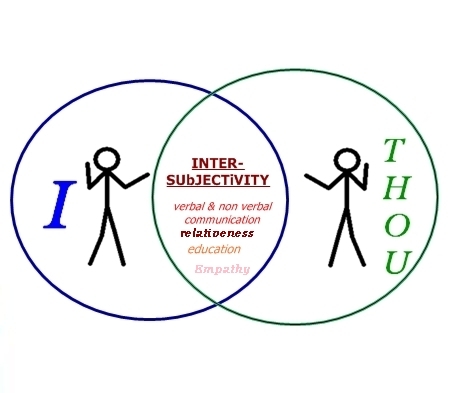 After the two fold contrast of Self and Other arises; and two subjects recognize an intersubjective meeting, A twofold attitude with the contrasting of sameness and difference arises. This not a state between sameness and difference, according to Kohn, rather a “dynamic tension of the two”. We are at the same time excited by the novelty of otherness, sometimes startled sometimes curious. If If man is to reach beyond his own hands grasp , it could be said one seeks out otherness beyond himself. In interpersonal relationships, we very often find another person’s Otherness, including the persons individual experiences and circumstances, compelling or alluring. Many Neuroscientists believe that they have located “Mirror neurons” in the human brain. These neurons are believed to active when we observe other people actions. In certain developmental stages (the experts argue the exact ages) one learns by observing others, an interpersonal action.